The fisher (Martes pennanti) is a small carnivorous mammal native to North America. It is a member of the mustelid family, commonly referred to as the weasel family. 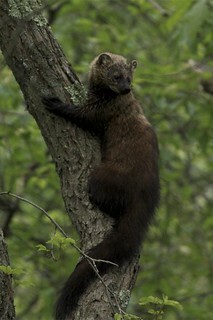 The fisher is closely related to but larger than the American Marten (Martes americana). The fisher is a forest-dwelling creature whose range covers much of the boreal forest in Canada to the northern United States. Names derived from aboriginal languages include pekan, pequam, and wejack. It is also sometimes referred to as a fisher cat, although it is not a feline. Wejack! Sounds like a ‘70s movie cop who doesn’t play by the rules. Let's go with that. Who's with me?